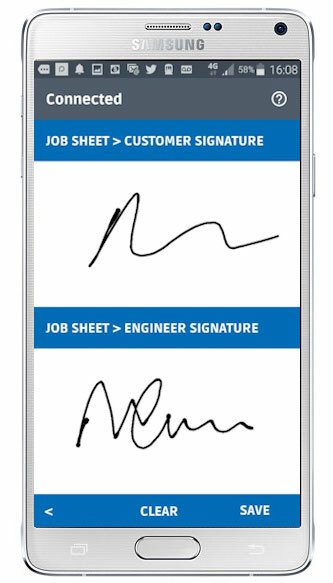 Simply, the simplest customer signature application on the market in any app. Your customer signs for the work and your Field Team Member witnesses it. What could be simpler? And the best bit is that it is built into Flobot Field App and comes as standard, no extra charge - free! The time of the signature is recorded on the electronic job sheet. The co-ordinates of the signature are imprinted onto the electronic job sheet. Well you have a name, a signature, a time and a location as reference for this transaction taking place - and that is going to be pretty hard to dispute in the event of well - a dispute. Even Robert Kardashian would struggle with that kind of evidence. An electronic document designed to replace any paper versions. Produced by Flobot Field app, recorded in Flobot System and along with a customer signature it provides a record of any work carried out and recommendations for follow on projects.